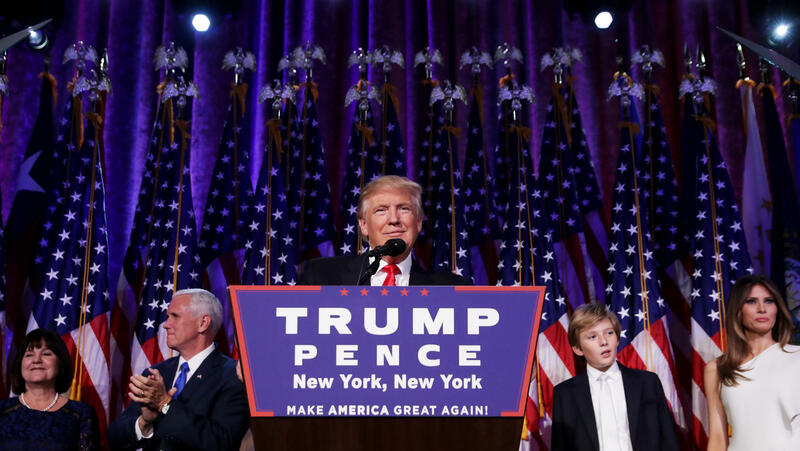 Republican president-elect Donald Trump delivers his acceptance speech during his election night event in New York City. The rise of Trump, a candidate with no prior experience in the military or elected office, confounded nearly everyone in politics. Improbably, the real estate scion turned reality TV star had not even been a member of the Republican Party for long. That made his victory over Democratic rival Hillary Clinton even more stunning, preventing her from becoming the nation's first female president. Taking the stage to cheers, Trump said Clinton had called him to offer her congratulations and to concede the race. "Now it's time for America to bind the wounds of division and get together," he told supporters in New York City. "It is time for us to come together as one united people. I pledge to every citizen of our land that I will be president for all Americans." In a rough and tumble campaign, Trump convinced a large slice of the American electorate that the government, Wall Street and the justice system were rigged. 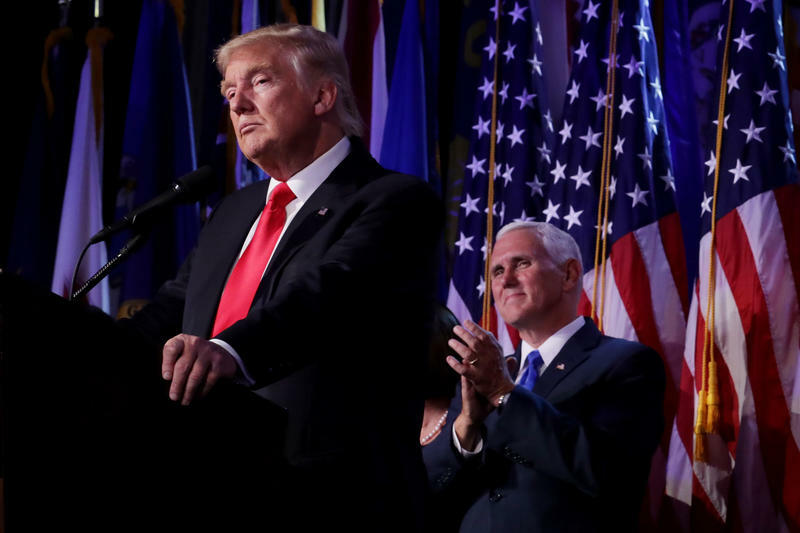 "I will be your voice," he told supporters, who then defied the polls to propel him to the nation's highest office. Critical battleground states broke Trump's way. Delegate-rich Ohio, Florida, Pennsylvania and Wisconsin moved to the Republican candidate. Many polls failed to predict those shifts, leaving the crowds at Trump's party in New York momentarily puzzled, then celebratory. About a mile away, in Manhattan, the event for former Secretary of State Clinton turned solemn. Clinton's campaign chairman, John Podesta, told a dwindling crowd early Wednesday that she would not be speaking yet. "They're still counting votes and every vote should count," he said. Republican Party elites initially brushed off Trump. But he bested 16 more experienced rivals in the primary process while spending little on traditional campaign infrastructure and relying on family members for political and media acumen. By the presidential race's closing days, Trump had won support from only one living GOP presidential nominee, former Sen. Bob Dole of Kansas. Turns out, he didn't need the extra help. "We want him to be as conservative and effective a president as possible," said Rich Lowry, editor of the conservative National Review, who has opposed Trump. "We're skeptical of him on many levels, but you only have one president at a time." Trump will succeed Barack Obama, a two-term president and the first African-American to occupy the office. The president-elect is virtually Obama's polar opposite and in fact needled Obama for years with false claims over his birthplace. Obama had campaigned feverishly to elect Clinton in hopes she would preserve his signature domestic health care law, revive a plan to open up a path to citizenship for immigrants in the country illegally, and nominate more left-leaning justices to the Supreme Court. By contrast, Trump's governing agenda is far less clear. He has promised to deport millions of immigrants who don't have papers, to build a wall along the U.S. border with Mexico and to bargain with foreign governments such as those of Russia and China. His list of nearly two dozen potential nominees to the nation's highest court is largely in line with conservative doctrine, if Trump in fact chooses from that list. There are hints that Trump, 70, would defer to his vice president, Indiana Gov. Mike Pence, on many key policy decisions. That would hardly be the first unorthodox decision by the candidate and his campaign. To say Trump violated the norms of political contests would be an understatement. He never released his tax returns, citing an ongoing audit that would not have barred him from making them public. He called his opponent a "nasty woman," launched his campaign by declaring that some Mexican immigrants who come to the U.S. illegally are "rapists" and flatly denied accounts from about a dozen women who accused him of past sexual misconduct or assault. Many voters also appeared to be undeterred by the release of a 2005 videotape from Access Hollywood in which Trump, on a hot mic, talked about grabbing women between the legs because celebrities "can do anything." His relationship with Congress represents another uncertainty. 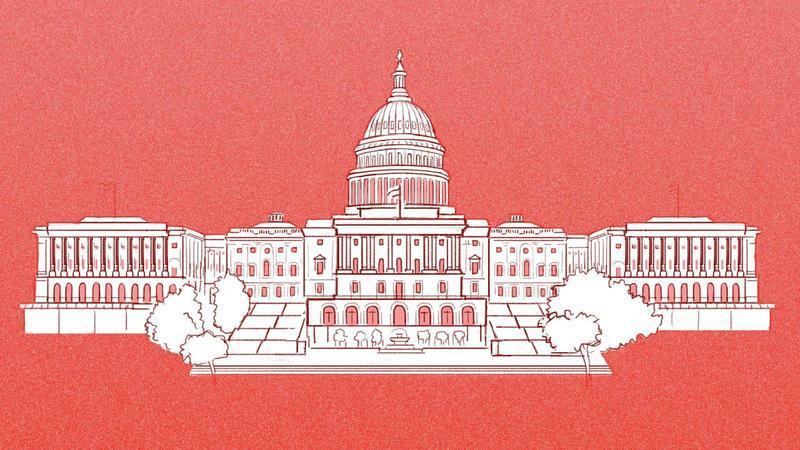 Republicans maintained control of both the House and the Senate, but Trump has openly feuded with Republican lawmakers such as House Speaker Paul Ryan. In other cases, Trump promised to create a superPAC that would go after his enemies. The election deals yet another bitter defeat to Clinton, 69, a former first lady and U.S. senator who had appeared to retain a modest lead in national polls heading into Election Day. Clinton, the first woman to run atop the ticket of a major political party, had cast her candidacy as an inclusive vision for the future. She pledged to devote new resources to restoring American infrastructure, to fight for gun safety measures, to fix a broken immigration system and to nominate judges to the Supreme Court who would overhaul the campaign finance system. Clinton had been shadowed for more than a year by revelations she used a private email server to conduct State Department business. The FBI investigated her handling of classified information and determined that "no reasonable prosecutor" would have filed any criminal case. But in the final weeks of the campaign, FBI Director James Comey dropped a bombshell. He notified Congress that the agency had discovered a new cache of emails and needed to sort through them, just 11 days before the election. Comey later announced the FBI had found nothing to change its analysis in the case, after polls between Clinton and Trump had tightened. Former Trump adviser Barry Bennett attributed the victory to the idea that Trump understood the mood of voters better than the political professionals. "It's a testament to how angry they are at Washington, and Washington better hear it," Bennett said. "Perhaps we got a little aligned too closely with business and not with the people. So maybe this is a shift back, which would be good for the party." Trump supporter and onetime candidate Ben Carson put the president-elect's appeal this way: "As I've said all along, this is not about Democrats and Republicans; this is about we the people versus the political elites." DONALD TRUMP: Thank you, thank you very much. Sorry to keep you waiting. Complicated business, complicated business. Thank you very much. I've just received a call from Secretary Clinton. She congratulated us — it's about us — on our victory. And I congratulated her and her family on a very, very hard-fought campaign. She fought very hard. Hillary has worked very long and very hard over a long period of time and we owe her a major debt of gratitude for her service to our country. I mean that very sincerely.